NOTE: The present rhinoceros horn cup is impressive for its magnificent size and beautiful light coloration from which the figures appear to loom. The natural 'peel' surface of the material is a characteristic found in the highest quality rhinoceros horn carvings and is often compared to the texture of the finest doeskin glove when stretched over the hand. Jan Chapman, in The Art of Rhinoceros Horn Carving in China, London, 1999, p. 60, notes that the natural yellow and honey colors are probably the result of the natural aging process of the horn, and some of the earliest known carvings are described as being yellow in color. 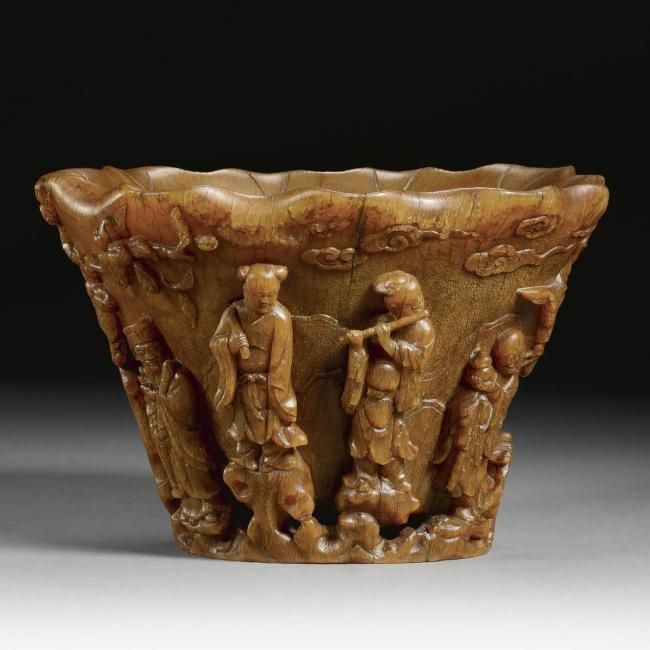 For a rhinoceros horn cup of this size and similarly decorated with the Eight Daoist Immortals in the peach garden of the Land of Immortals, see one in the Chester Beatty Library, Dublin, illustrated ibid., figs. 270-272; and a smaller example, in the Osaka Municipal Museum, published ibid., fig. 166. 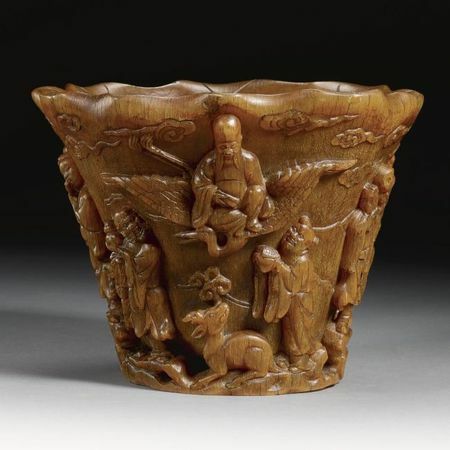 A very small rhinoceros cup carved in high relief with the Eight Immortals, from the Thomas Fok collection, illustrated in Thomas Fok, Connoisseurship of Rhinoceros Horn Carving in China, Hong Kong, 1999, pl. 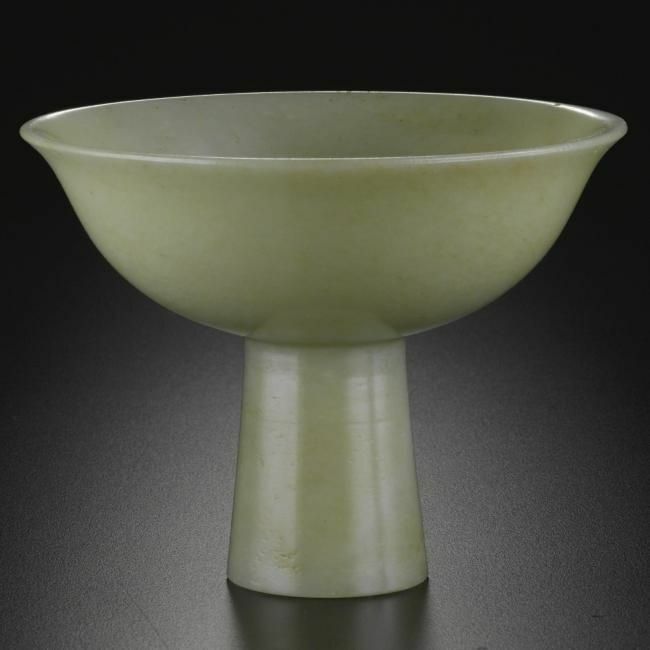 82 and included in the exhibition Metal, Wood, Fire and Earth: Gems of Antiquities Collection in Hong Kong, Hong Kong Museum of Art, Hong Kong, 2002-05, was sold in our Hong Kong rooms, 1st June 1994, lot 161. The hoqua gift rhinoceros horn bowl a rhinoceros horn 'lotus' bowl. ming dynasty, 15th century. A rhinoceros horn seal. ming dynasty, 16th-17th century. A fine and large rhinoceros horn carved cup, 19th century.